Tumultous Cardinals season continues with firing of Mike McCoy. TEMPE – The turnovers kept coming for the Cardinals on the field Thursday night. After an embarrassing 45-10 loss to the Denver Broncos, the team decided to execute one more, and this one was related to their coaching staff. The team announced Friday it had fired offensive coordinator Mike McCoy. There was a game tonight. That angered some fans more. Many called for the firing of McCoy. Others called for Wilks to share a carpool out of town with McCoy. Then, as if to illustrate just how far the Cardinals had fallen, a sprinkle of Cleveland Browns fans showed up on social media, expressing how they grieved for Arizona fans. The supporters of one of the least accomplished franchises in sport history felt the need to give Cardinal fans a digital hug. On Friday, the team seemed to acknowledge what many fans had been suggesting for weeks: The offense was in need of a revamping. The Cardinals rank last in the league in total offense (yards per game), and 31st in passing yards, rushing yards, receiving yards and touchdowns. For McCoy, his release from the team marks consecutive years that he has been fired as offensive coordinator in the middle of the season. In 2017, the Broncos fired him after a six-game losing streak. Byron Leftwich takes over as the Cardinals offensive coordinator, while remaining the quarterbacks coach for 21-year-old rookie Josh Rosen. Leftwich, a 2003 first round pick, played nine seasons in the NFL at quarterback. 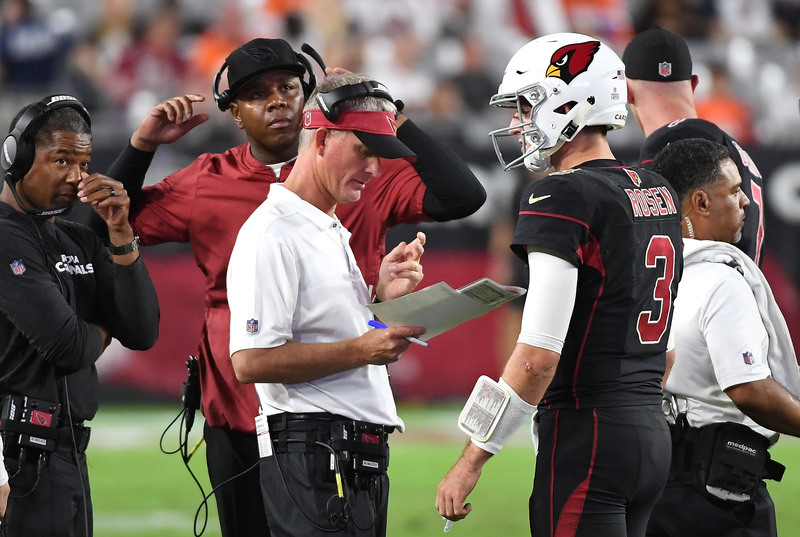 Wilks notes that Leftwich’s experience connects him to Rosen is severable valuable ways, including his understanding of the pressures of being a starting NFL quarterback, and his ability to communicate to Rosen from a quarterback’s perspective. “I feel very confident in the coaching staff we have on that side. We just need to really tap in and use those resources. It’s going to be a collective effort on everybody’s part to be able to get this thing going,” Wilks said. Nine games remain in the Cardinals’ 2018 regular season, and 10 more weeks are left for the team to shows encouraging signs of life. If not, many believe, McCoy may not be the only one out of a job.